The Star Wars shop has the next in line for super cool scaled replicas...the Exclusive Black Chrome Edition Anakin Skywalker Scaled Replica Lightsaber !! Don't miss out on this 3rd in a series of black chrome sabers...and, if you're lucky you just might score one of the 200 gold plated sabers! Good luck! While you are there, don't forget to check out the cool General Kenobi Animation Character Key Matted Sericel . For this limited edition (750), Clone Wars Obi-Wan has been reproduced on a clear acetate cel which "floats" above the illustrated backing board. Depicted behind the image of Obi-Wan is the character's unique color set, a rough pose with hood, and character stats. 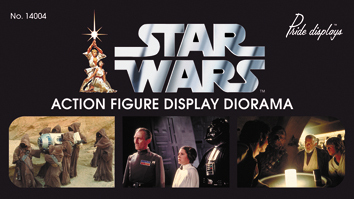 The 12" scale of figures makes its debut in our Revenge of the Sith Visual Guide. Starting off, we have a pair of fan favorite Jedi women: Barriss and Shaak Ti. Click the thumbnails to check them out, and thanks to Alliance Collectibles for getting these for us! 1st Sideshow Luke at the Star Wars Shop! No way!! You don't want to miss out on this again. The first of the Sideshow statues, Luke Skywalker, is up for pre-sale at the Star Wars Shop ! This Sideshow Star Wars statues stands at 17" tall and was thought to be long lost to the secondary market. Don't think twice about ordering Luke, he will be sold out before long for sure! The latest update from Hasbro highlights the Galactic Heroes Backpack Danglers! Click the images below to take a closer look. The Exclusive Remote Control R2-D2 Action Figure will be available exclusively to Hyperspace members until Friday, July 1st. Thereafter, if the product has not sold out, it will be opened up to all customers. This is one toy that has become a favorite among many in the Lucasfilm staff. This miniature remote control R2-D2 from Japan is just about the same scale as the Hasbro action figure version, but includes all the bells and whistles (literally!) that has made R2 a favorite among fans. As the official and exclusive U.S retailer for this collectible, this one will be hard to find elsewhereWith the mini-lightsaber remote, R2 will move forward or turn on command, rotate his dome as he rolls, beep and whistle, and illuminate his photo-receptor "eye". You may have seen me as alias: mikeskywalker1969 on the boards here at JTA. I'm mainly active in the customs section, though I'm known to post in other areas from time to time. I'm an original Star Wars Generation Fan. I saw the original Star Wars in 1977 at the ripe old age of 8! That was the perfect age to be introduced to that galaxy far, far away, because it was the right age to be blown away by that film with a childhood sense of wonder and amazement that maybe you wouldn't have if you were older. For that reason, the film still inspires today, and I continue on my twenty-eight year path of collecting joy! It also has allowed me to meet up with people who share my enthusiasm like Pete & Chuck, who created JTA, along with Mike, to share their love of Star Wars and give us all this great archive with the help of still others who also love these films and collecting. The other great site that you will ALWAYS see me on is www.kswcc.com The Kentucky Star Wars Collector's Club! I am a very active member of that group where members get together to buy, sell, and trade Star Wars "stuff." If you get a chance, check us out! Other things of note: I'm married, have a three year old daughter who also loves Star Wars and went with me to all four days of CIII! It's great to be here at JTA! Always feel free to email me anytime. I'm always eager to talk Star Wars! "May The Force be with you, always,"
The Chancellor's Office Battle Arena has been added to the Revenge of the Sith Visual Guide. Relive this epic battle between Darth Sidious and Mace Windu...heck, if you like, you can even have Mace live at the end! Pick up this Battle Arena and others at Alliance Collectibles! The Revenge of the Sith Visual Guide adds the deluxe Anakin Skywalker...or is it Darth Vader? This deluxe figure needed the deluxe VG treatment, taking up a whopping four guides! Check out each view below! And yes, this really is just one figure! Our pals over at Rebel Scum have uncovered some interesting news on some new Clone Trooper 3-packs. Each of the 3 packs is to have a set of either the Shock Troopers, the Orange trimmed Clones from Utapau or the famous 501st Clones. Read more right here. Oh, you all know our latest staff member already because we are sure that you stopped by BeJedi from time to time! And...here are a few words from the man himself! I am sure he will...and not only will Joris be a familiar face to the community, but he's going to share with us many of the unique features that used to be at BeJedi! Keep an eye out for new features at JTA in the near future (one was hinted at in Joris' intro). Welcome to JTA Joris! How cool would it have been to see flying clones in Revenge of the Sith? Awesome...well, they didn't make the cut for the movie, but they made the cut here...the Deluxe Clone Trooper has been added to the Revenge of the Sith Visual Guide. Click below to check him out! And...don't forget to head on over to Alliance Collectibles to build your flying clone army! Head on over to Alliance Collectibles and pick up a fleet of Vultures and the man who orders them to be shut down at the end of the Clone Wars! Brianstoys.com latest newsletter is packed with great stuff from Revenge of the SIth, the Original Trilogy Line, the Master Replicas AT-AT and more! And, don't forget to stop at their booth at the G.I. Joe Convention this weekend in Minneapolis, MN!! Mustafar Mission: Anakin contemplates the impact of his mission amidst the apocalyptic landscape formed by the lava flow from the erupting volcanoes in the fiery world of Mustafar. Lava Droid: Build your own from the simple recipe provided. Clone Assault: A couple of Jedi with an army of clones on a mission in the outer rim territories launch an assault in the palatial grounds of the separatist leaders. Hasbro has updated their site once again...this time with news of the Jedi vs. Sith Battle Pack. Click below to learn more about it! The Official Site has posted some news on what to expect out in San Diego in a few weeks for Star Wars fans! We'll hear about some great new book coming our way, from Dark Horse and the exciting changes to the Star Wars comic lines, Master Replicas and the surprises they have in store for us and, of course from Hasbro and what we can expect in the way of figures this fall celebrating the entire Saga and a hint of what it to come in 2006! Of course, Steve Sansweet will be there to give us all an update on the future of Star Wars! New Master Replicas at StarWarsShop! StarWarsShop.com has 2 more Master Replicas items in stock. The first is the Star Wars Shop exclusive .45 Black Chrome Edition Anakin Skywalker Scaled Replica Lightsaber. This is the 3rd in a series of dark chrome mini-sabers. If you have a taste for the expensive, the next item they have in stock is the very cool AT-AT Imperial Walker, Episode V, Signature Edition (limited to only 750 pieces). Click on over to get a close-up of these Master Replicas exclusives! The Revenge of the Sith Visual Guide adds another army builder to the guide: The dreaded Destroyer Droid. With our basic figure guides nearing completion, start looking for the rest of the ROTS line to be added to the guides in the coming weeks. Every droid army needs a leader, no matter how he is finally done away with. Head on over to Alliance Collectibles and pick up your General Grievous and some of his grunts today!! What do the phrases "May the Force be with you" and "I'll be back" have in common? Well they both made the AFI Top 100 Most Memorable Movie Quotes! The Force landed 8th all time...not bad!! To see that the other 7 were that beat it out (and the 92 that came behind it) click here to get reading. Anakin's Jedi Starfighter (Green) $29.99 - Available Now! The Jedi Temple Archives would like to welcome Federation Toys to the family! They have got a super store where they've got everything for your Revenge of the Sith, POTJ, Saga needs and more! And, as a special deal, all you have to do is mention Jedi Temple Archives and you'll get 5% off your order!! Head on over to Federation Toys and check them out today! The super-articulated updates continue! This time, Target's exclusive Clone Trooper has been added to the Revenge of the Sith Visual Guide. This one is very much like the standard SA clone trooper, but now sporting the markings of Commander Neyo's squad of clones, who ambushed poor Stass Allie on her speeder bike. Hasbro has updated their site today with the Anakin Skywalker to Darth Vader set. The set includes Anakin from Episodes II & III and Darth Vader from Episode IV!! Read more by clicking below! For those of you who missed out on the Celebration III The Empire Strikes Back advance poster now you have a chance at it again. Code 3 is holding an auction for #1 in the series of 1980! Click the thumbnail to check it out. Hello from Toyfellas.com! We received new products from Hasbro & Toybiz. STAR WARS ROTS EP III DELUXE ONLY 6 OF EACH IN STOCK! And they have in plenty of Lord of the Rings TFOTR and ROTK series and G.I. Joe too!! Head on over to the Official Site to check out upcoming products that you'll just need to have in your collection! The The Ultimate Build Your Own Lightsaber Kit has all the pieces you'll need to build your own, custom lightsaber! And, for you Visual Guide buffs (and you must be if you hang out here) there is a sneak peek inside the The Star Wars: The Ultimate Visual Guide! Head on over and take a look! Super Promo Star Wars: 1/7 Pre-Painted Vinyl Figure Luke Skywalker Stormtrooper now at just $35. SAVE $65 now! All orders to be delivered week of June 26. 500th Darth Vader in stock! Star Wars Target Exclusives Die-Cast vehicles assortment Clone, ARC 170 Fighter, Land Speeder, Tie Bomber, Clone Swamp Speeder, and Naboo Fighter! Star Wars Remote Control Droid by Tomy Japan! Star Wars Kubrick series 4 figures! He ain't no Batman, but he's a super....articulated hero (yeah, that was bad). Clone Trooper #41 and all his points of articulation have been added to the Revenge of the Sith Visual Guide. Check it out by clicking the thumbnail below! Don't forget, to build your super articulated armies, stop by your favorite Star Wars super store...Alliance Collectibles!! The good folks over at Rebel Scum have some images from the Star Wars Licensed Goods Exhibition in Tokyo. Japanese manufacturers have shown plenty of stuff from Kotobukiya, Pepsi and TOMY. Click here to take a peek! It looks like a few updates, but it is just one figure. Palpatine with Lightsaber Attack has been added to the Revenge of the Sith Visual Guide. Initial releases of the Supreme Chancellor/Emperor/Sith Daddy had him packed in with Anakin's blue lightsaber...oops! Hasbro got right on it and changed the blade to red (but the hilt still needs to be corrected). Which ever version you buy, they both come with interchangeable parts to give him that fashionable Sith Lightning look that's in style this year. Red lightsaber or blue lightsaber? Head on over to Alliance Collectibles for all your Palpatine lightsaber needs! Just a quick reminder, 2005 Life Achievement Award - A Tribute to George Lucas airs tonight at 9PM EST on USA Network. Be sure to check out the preview over at USA's website, complete with a cool scroll featuring everyone involved. If you miss it tonight, however, don't fear. It will be airing numerous times over the next week. The full schedule is posted at USA Network. A special update to the Revenge of the Sith Visual Guide to wish all the Star Wars dads a Happy Father's Day. The droid that helped rebuild Luke's daddy, the "chopper droid" now lives in the ROTS guide! Now, all we need is that FX-6 and I'll be a happy camper! Get all your droids and treat yourself (or that special dad in your life) to some Star Wars goodies over at Alliance Collectibles today! Brianstoys.com has put out their latest news letter and this week they have new ROTS Meena Tills, Ask Aak & Tarkin in stock! AT-RT is back in stock as well! Order the Kotobukiya Darth Vader. And for the Gentle Giant fans they have both the Luke and Han in Stormtrooper disguise and this years TPB with bust-up pack-ins! Read the whole newsletter buy clicking below! Today, a pair of warriors are added to the Revenge of the Sith Visual Guide. From opposite sides of the war come the fearless wookie warrior, and the fearful neimoidian warrior. This version of the wookie warrior sports a darker coat. It is also available in a light coat version, which we will feature at a later update. Click the images below to see how these warriors from opposite sides stack up against each other. Two more guides have been added to Revenge of the Sith Visual Guide today...First we have the Gran from Malastare; Ask Aak, complete with figure stand and his rifle so he can take out anyone who opposes the Military Creation Act! Then, we have one of the coolest clones of the line...Commander Bacara! He's all suited up in his snow gear and ready to go! You know that just one Bacara won't be enough, so head on over to Alliance Collectibles and pick up a bunch for customizing into your own Snowclone army! going back to meet jake Lloyd. I was able to get the Star Tours "REX" figure. They also had the ROTS barc speeder with a wookie warrior in the package. First time I�d seen that. The Official Site has some news of a cool promotion this weekend for all you dads (and other ticket holders) out there! This is a one time only deal, so as if you really needed another reason to go see the film again, head out there and treat yourself, or your dad, to a cool Father's Day treat! StarWarsShop.com will be the exclusive U.S. distributor of a series of really great looking Glass Holograms. The Glass Holograms are from a company called Stiefelmayer-Contento located in Germany, and are Laser Engraved pieces of Art. So far only a few are available, but more of different Vehicles and Characters are on their way soon. To order yours click on the images below or to read the full details behind the 3-D Glass Art, click HERE. * Existing memberships will still be honored and you will remain eligible for early ordering and CS membership exclusive offers. **This piece will be retired December 31, 2005 and is only available thru the Collectors Society Kit. A great deal for those that collect the different lines. To sign up for your 2005 Collectors Society membership kit click HERE. The Revenge of the Sith Visual Guide updates continue with everyones favorite droid, R2-D2. This time, it's the electronic version. Much like his electronic predecessors, you push the center button to get R2 to communicate with you. Click the thumbnail for a closeup view. According to reports, the R2 wave, along with General Bacara and the battle damaged version of Anakin Skywalker, is now hitting retail stores. You can also pick all three up at Alliance Collectibles. What mixes Revenge of the Sith, Star Wars Miniatures and a good shot of humor? Why Dork Tower comics of course! Check out this little piece sent in by Embra!! Our pals over at Mint In Box have come up with a dandy today...they have uncovered pics of a 501st Clone Trooper that will be made by Kotobukiya! Click here to take a look at it! Two more guides have been added to the Revenge of the Sith Visual Guide today...Senator Meena Tillis and the soon the be Vader's right hand...Governor Tarkin! Just click below to check them out and then head on over to Alliance Collectibles...they have these and more in stock, so don't delay! New Sponsor Welcome - Autograph Bounty Hunter! Yes, it's true, the Autograph Bounty Hunter has found a new outlet for his "hard merchandise" and we're happy to have him with us here at JTA!! He's got a "Slave I" load of great autographs for you so head on over to Autograph Bounty Hunter and see what he's got in store for you! And...from the Bounty Hunter himself...June 15th, the Bounty Hunter launches his next Sith Signing. It�s a blow-out sale of stock items that have not been shown to the collectors before. It contains some very rare items indeed and is based on a first come, first served basis. Happy Hunting at Autograph Bounty Hunter! Another clone joins the Revenge of the Sith Visual Guide. This time, the very cool Clone Pilot flys into the guides to join the rest of the clone army. Keep checking back for daily ROTS updates, and check Alliance Collectibles to help fill the holes in your collection and build those clone armies! The Star Wars Shop has the Limited Edition Clone Wars Barriss Offee and Luminara Unduli Maquette available for pre-order! The edition size is yet to be set, but don't think twice because this is one piece you don't want to miss!! The Revenge of the Sith Visual Guide welcomes in Anakin Skywalker, or rather, to be technically correct, Darth Vader, into the guides. More like a deluxe figure in basic packaging, this is really 2 figures in one...Darth Vader before and after the battle with his one time "brother" Obi-Wan Kenobi. Alliance Collectibles has the figures you are looking for all the way up to #50, so head on over and stock up now! Here are a few more additions to the Gentle Giant Visual Guide. Although these were available only at the Hastings stores, the bust-ups included with the trade paper backs were not exclusives at all. The Darth Vader that came with the Empire Vol. 1 TBP and the Stormtrooper that was included with the Infinites TBP are both identical to their counterparts in The Villains of the Dark Side series...check them out below. Brianstoys.com has put out their latest news letter. This week they have the latest Gentle Giant Darth Vader statue, deluxe figures including the crab droid an clone 3-packs and pre-orders on all figures up to #56!! Click below to read the entire article and start shopping! Here's a little something for those of you who live on the right side of the big pond called the Atlantic...a European Master Replicas exclusive, well, actually 2 of them! Master Replicas will release Chrome Darth Sidious and Yoda lightsabers in specially marked boxes that will carry the EU flag. They will be a limited edition of 5,000 pieces each. Read more and see a great picture of them over at The Private Universe! Hello from Toyfellas.com! We received 2 Cases of Family Guy Series 2; we should receive 2 more soon. We also have confirmation that our order of The Lord of the Rings Asst 5 of Fellowship of the Ring, The Two Towers & Return of the King will arrive next week. We have many exciting items in stock now; please have a good look around. Kotobukiya Yoda Pre-Painted Soft Vinyl $38.24 & only 3 left. ROTS Clone Commander Battle Gear $10.00 very limited. Clone Trooper Super Articulation very limited. Family Guy Series 2 Figures $10.99 & Up. 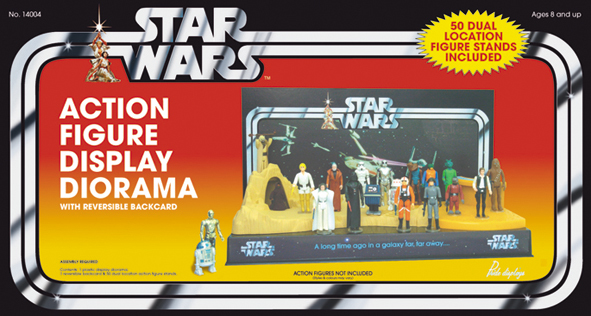 KB Toys has a Collector's 9-Pack for pre-order on its site...the pack includes the likes of Luminara Unduli, Count Dooku, Royal Guard, Kit Fisto, Bail Organa, C3PO, Ki-Adi-Mundi and Chancellor Palpatine and a new Silver Darth Vader! 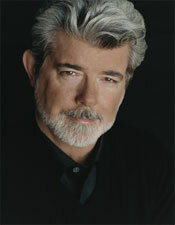 As everyone knows George Lucas has been Selected as the Winner of the 33rd AFI Life Achievement Award. The Award is the "highest honor for a career in film". Lucas will be presented the award on June 9th (Today), in Los Angeles. However, what some may not know is that the Tribute will be broadcasted on June 20th on USA Network. To read the full details click on the image below! Again Many Congrats To Mr. Lucas, it is well deserved indeed! That's right...all you need to do is what you want to do all ready and go see Revenge of the Sith one more, or maybe 5 more...10 more? times and you could be the winner of a cool Star Wars Pinball machine! All the details are at the Official Site, but it basically just comes down to mailing in your ticket stub! There are contests for the fan who sees it the most times and largest group outing too! Click below and read on! The Star Wars Shop now has the fantastic A New Hope 3D Movie Poster Sculpture Style D up for pre-order! This is the 4th in a series of spectacular 3-D vintage movie posters created by Code3 Collectibles and your chance to get at least one of the A New Hope posters (the Style A sold out). The edition size is limited to just 3,000, so head on over and order yours today! Oh man! T-shirts, pin sets, coffee mugs, posters and more...the evil MPire is taking over the merchandising of the Revenge of the Sith! Head on over to the official MPire site to see all the great new things the MPeror has in store! Gentel Giant - SDCC Exclusive! Gentle Giant has got one mean looking silver bounty hunter to offer as an exclusive this year at the San Diego Comic Con...A silver Jango Fett bust-up will be one of the Gentle Giant prizes this year (will there be more?) They will be distributed on a per day basis...check back with us here for more info as the convention draws nearer! Sideshow Collectibles has the extremely limited Floppy Hat Luke up for pre-order today. The pieces that were put aside for those not able to attend the San Diego Comic Con are already sold out, but the waiting list can still give you some hope! However...if you are able to attend the SDCC, you are still in luck, there are still some up for grabs, so click here and pre-order yours before it's gone forever! Do you have one of the other 2? We'd love to hear from you so we can add it to the Visual Guides...Just drop us a line by clicking here and we'll let you know what to do! In the meantime, click below to check out Black Hole Stormie number one! Hasbro has got up all there is to know about the new Micro Battle Sets due out at your local Target later this summer! These fantastic playsets convert into ships once your done...or vice versa...Click below to read and see more about the Sith Attack, Mustafar Duel and Kashyyyk Assault sets! The first version of the BARC Speeder has been added to the Revenge of the Sith Visual Guide today...this version comes complete with a BARC Trooper and a zip line to send your BARC Speeder off to battle! Check it out below! We've updated our Revenge of the Sith checklist to add all the items that we've simply not had the time to add since April 2nd, so head on over to the ROTS Visual Guide or download it here. Reports are in that the OT cup figure sets that were originally available in Japan only are showing up around the US now. Han Solo, Boba Fett and Yoda are all packed in ROTS packaging, but sport cups from each of the 3 movies from the OT. Got cups or other cool finds? Send your pics in to us here!! Some more Gentle Giant bust-up exclusives have been added to the Gentle Giant Visual Guide today. The Holographic Emperor Palpatine was an exclusive in the Crimson Empire TBP. The Clear Amber Chewbacca could be found in the Border's Book edition of the Clone Wars Vol. 1 TBP. Both came with an additional pack-in that had been released in another line. Check them out by clicking below or by heading over to the Gentle Giant Visual Guide. OK, we're not exactly sure how accurate this news is, but Si-Fi Online reports that ComingSoon.net reports that this fall the entire Star Wars Trilogy will be out on DVD...possible, but what does seem to be more accurate is the ComingSoon.net report that The Revenge of the Sith DVD will be released on November 1st...Thanks to Iain for the tip and stay tuned for more information as it becomes available! Bringing in $26.0 million this weekend CNN reports that Revenge of the Sith has fallen to 3rd at the box office behind Madagascar (28.7M) and The Longest Yard ($26.1M). Read about the sad news right here. Mixing it up a bit today we'll move away from Episode III for a moment and add the holographic Darth Maul and Darth Vader bust-ups to the Gentle Giant Visual Guide. This pair is an Action Figure Xpress exclusive that you can check out simply by clicking the thumbnails below. Brianstoys.com has put out their latest news letter. They've got plenty of Episode III action figures and LEGO, not to mention plenty of Gentle Giant and Master Replicas stuff packed into this weeks news letter! Click below to check the whole thing out! Today we are adding a vehicle to the Revenge of the Sith Visual Guide...the AT-RT with AT-RT driver! One of the predecessor to the AT-ST, this cool little open cockpit vehicle comes with its own specialized trooper. Click below to take a closer look! Obi-Wan Kenobi and his lizard-bird transport the Boga have been added to the Revenge of the Sith Visual Guide today...Check them out below! The folks over at Pride Displays who are bringing us the ultra retro figure display stands that will make you feel like you are back in 1978 again have been given the go ahead on their packaging design! The diorama measures a WHOPPING! TWO FEET in width and the equally EPIC box is complete with all touches that we all cherish from the original packaging... with one exception!Sadly we could not find any suitably 70's looking children in bad pullovers! Their web site is being updated as we speak, but to be one of the very first to see the cool retro packaging just click on the thumbnails below! The Official Site has some great news for LEGO fans....later this month at Shop at Home a LEGO Sandcrawler will be up for sale! This first ever version of the famed vehicle for our favorite scrap collectors will feature a functioning steering mechanism for the rear wheels, treads on wheels for smooth motion, a removable crane for moving droids, an opening hatch revealing the inside of the sandcrawler and more! The set contains nearly 1,700 pieces and comes with 11 mini-figs including Owen, ASP droid and a Treadwell droid!! Read all about it by clicking on the thumbnail below! Not an official announcement, but up on the Hasbro web site are images of the 3rd wave of Titanium vehicles. The newest ships that we'll find in this line are the ARC-170 Fighter, ISP Speeder, Landspeeder, Naboo Fighter and TIE Bomber...Click here or the thumbnails below to check out the whole assortment! Thanks to J Foreman for the heads up! OK...just because I had technical Internet difficulties and I was moving into a new place didn't mean some guides weren't being worked on right after I got back from CIII. Unfortunately, that was about a month ago, so there is some catching up to do and we are going to kick that catching up off with the Lava Vader and Holo Yoda Exclusives! More to come as the days roll on by...I have to get these off the personal computer you know! I'm just itching to get some more of these guides up for all to view, so a bonus update today with #33 Clone Commander and the Blue Royal Guard (#23)...Just click the thumbnails below or head on over to the Revenge of the Sith Visual Guide to check them out! Whoops, this is one we missed out on late last week...Hasbro has posted images of the upcoming MPire figures featuring your favorite melt in your mouth, not in your hands candy dressed up as your favorite Star Wars characters! Check them out by clicking below! If you are ready for another exceptional piece by Gentle Giant, then take a peek at the Scout Trooper and Speeder Bike Statue on his Speeder Bike diorama. If you have seen this piece at Celebration III then you know that this 7" scale diorama is one worth adding to the collection! It is due out in November but can be ordered today by clicking here! Don't miss out on this one...The Official Site announces that pre-orders for those of you going the San Diego Comic Con exclusive Holographic Princess Leia are being taken starting today! Place your pre-order now and all you'll have to do is go to the Pavilion and pick them up, that easy! You pre-order them at the Star Wars Shop , but they MUST be picked up at the show...if there are extras they will be put up for sale down the line for those who cant make it to San Diego. We've seen the images, we've heard the news...now hear it and see it all from the source...Hasbro has updated ether site with Darth Vader as the 500th figure made...check it out here! Craving a bit of chocolate fun? Well then, if you haven't already, head on over to the official Chocolate MPire web site and check out the screensavers, wallpapers, products and much, much more chocolate fun...just one question...will you chose the Milk Chocolate Jedi Side or the Dark Chocolate Side?